Musings of a Durotrigan: EDL Walthamstow Protest: Banned, but will it go ahead? EDL Walthamstow Protest: Banned, but will it go ahead? Minister for Policing Damian Green this afternoon announced a ban on marches in the following areas for the next 30 days: Islington, Newham, Waltham Forest and Tower Hamlets. The EDL have instead been offered the opportunity to protest outside if Parliament this Saturday, but it is thought that they will instead opt to try and hold a static protest in Walthamstow. Green's decision has also irritated WAWF, so it would seem likely that at least a number of its supporters are likely to ignore the banning order. This comes at the end of a turbulent week for the EDL, insofar as its leader - Stephen Yaxley-Lennon (Tommy Robinson) - was arrested on Saturday as one of a group of 53 EDL supporters who were en route to east London. He was arrested for the alleged assault of Sayful Islam in Luton on Saturday morning; 'suspicion of conspiring to cause a public nuisance' (this is why the 53 were detained) and for illegally entering the USA in September, allegedly using forged documents. Kevin Carroll, subsequently released, was also amongst the 53 detainees. According to the Gates of Vienna blog, Yaxley-Lennon's former political colleague Paul Weston was also arrested outside of Wormwood Scrubs on Monday when attempting to ascertain whether the former was being held at the prison, the pretext for his arrest being stated as 'a breach if the peace'. What has happened since then is not clear, as no information appears to have been forthcoming. It thus seems that whatever happens on Saturday, the EDL leader will not be at the demo, wherever it takes place. His recent announcement that he was to turn the EDL into a political party and leave the BFP of which he had been joint vice-chairman for a number of months, underscored Yaxley-Lennon's desire to reconnect with the EDL support base, having ascertained that leading the movement was where his strength lay. The EDL's opponents will doubtless view this week's developments with a certain malign glee, but although they would wish that it were finished, it doubtless has life left in it yet. Presumably the reason behind all the arrests was to smear Kevin Carrol, who as you know is standing for Police and Crime Commissioner for British Freedom in Beds. 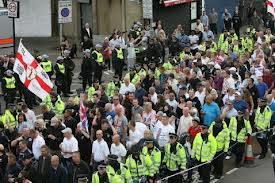 As for the cancelling of the Wolthamstow protest, I guess this is because the Met will not oppose a disorderly crowd containing Muslims unless they have no other choice. And the WAW crowd contained Muslims who had been fired up by UAF members who'd went into local mosques. In England has there ever been a person as brave and determined as Tommy Robinson. With great personal sacrifice and risk to himself and his family he decided to lead a direct action movement against the religious enemy within, namely Islamic Jihadis. The political establishment and their proxy street enforcers UAF and the media targeted Tommy. He was subjected to police harassment and victimisation but he stood firm and never wavered from the cause he was pursuing. Cameron and his police chief Bernard Hogan-Howe have been determined to smash EDL and we now see Tommy held in Wandsworth nick. Criticism of EDL strategy is legitimate but personal attacks on Tommy are in my opinion grossly unfair. The man should be an inspiration to all of us who want to see action and radical change in a country which is slipping into the abyss minute by minute.